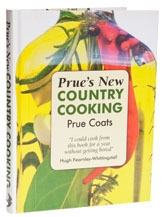 Prue should be pretty well-known to game and fish cooks, thanks to Prue’s Country Kitchen, which was published in 1988; and The Poacher’s Cookbook, published in 1993; not to mention her contributions to The Shooting Times and The Field. In a sense, Prue helped kick start a small revolution in British game and fish cookery, by encouraging people to abandon the old ‘roast it or boil it’ school. My only sorrow is that despite having twenty five years of writing behind her, cooks still don’t reach for her books when they can’t make their minds up about what to do with a pheasant and it is only a matter of time before I am served the dried out wreckage of another one. A good, solid cookbook that should find its way into every fisherman’s kitchen.